Burrowing Bunny Brownies - Recipe! - Live. Love. Laugh. Food. Peeps are one of those Easter candies that you just can’t miss during this season. 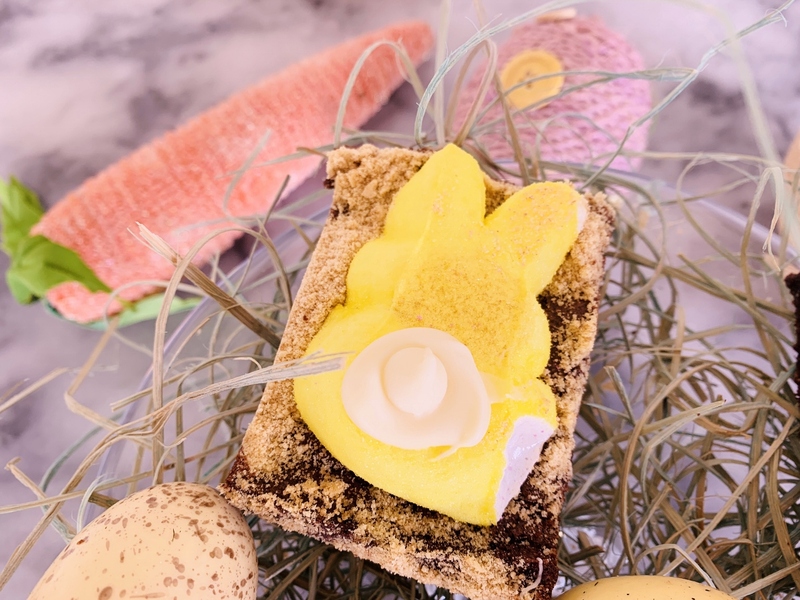 These sugar coated marshmallows are crazy-colored and shaped into bunnies, birds and rabbits – they just happen to be one of my favorite things in an Easter basket. Yes, they are overly sweet and when you bite into one, you cringe slightly from the intense sugar on your teeth, but that’s what’s so fun about them. 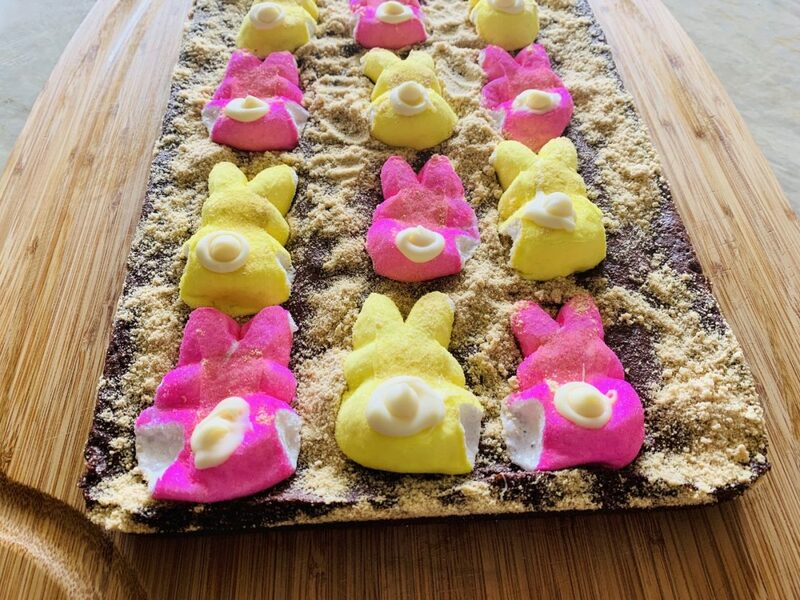 I am such a fan that I thought this year I would make a dessert that included Peeps, and this is what I came up with – it’s pretty fun. 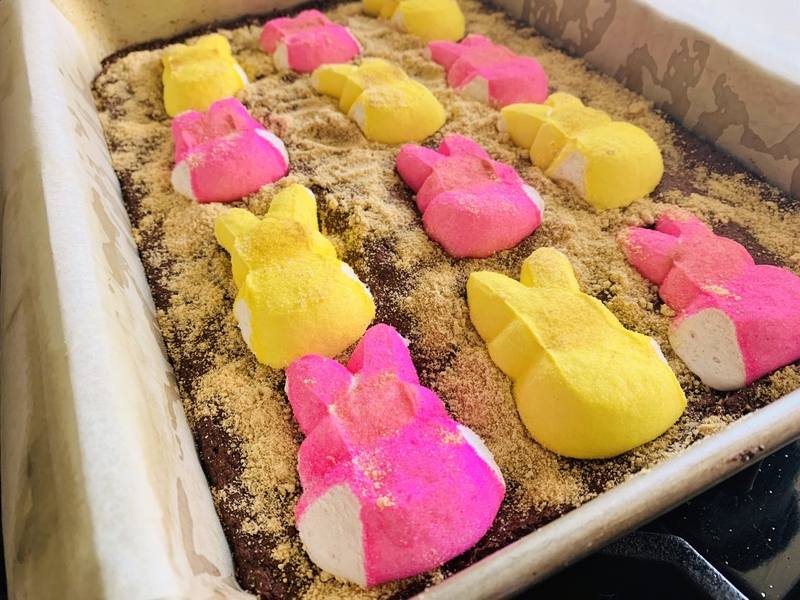 Brownies are always a fan favorite, but I thought a brownie with a Peep and graham cracker crumbs on top would taste like a S’more fresh off an open fire. 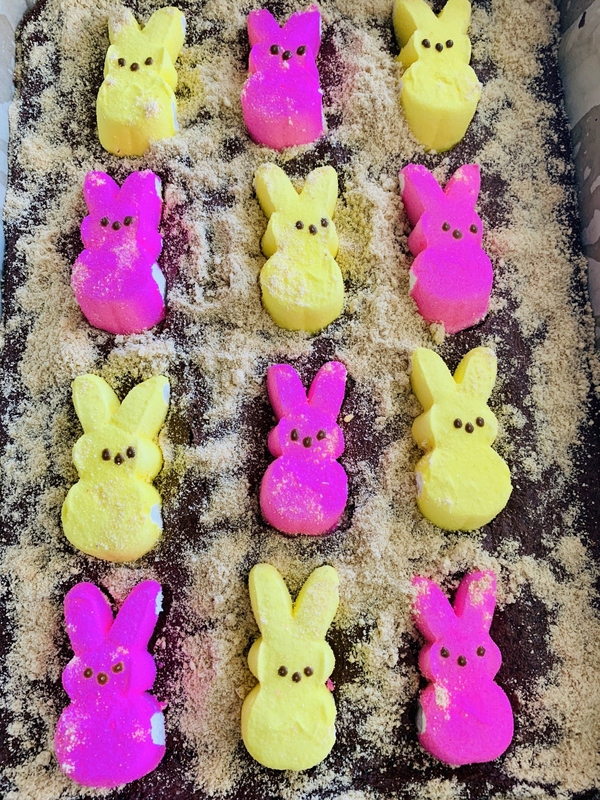 I wasn’t quite sure at first how a peep would hold up in the oven, so I placed them on top of the brownies with just a few minutes of baking time left. 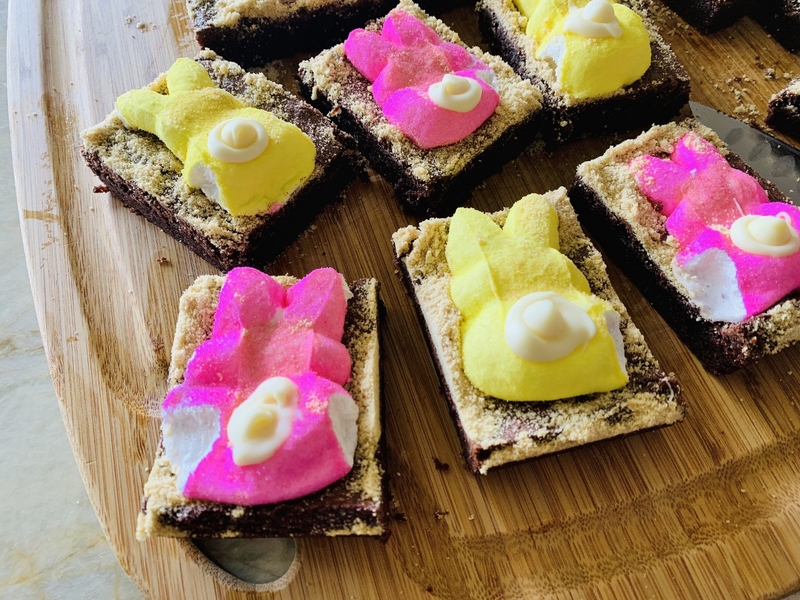 The results were a crackup because the Peeps eyes and nose baked into the body and the bunnies looked as if they were face-down in the brownies, a burrowing sort of look. 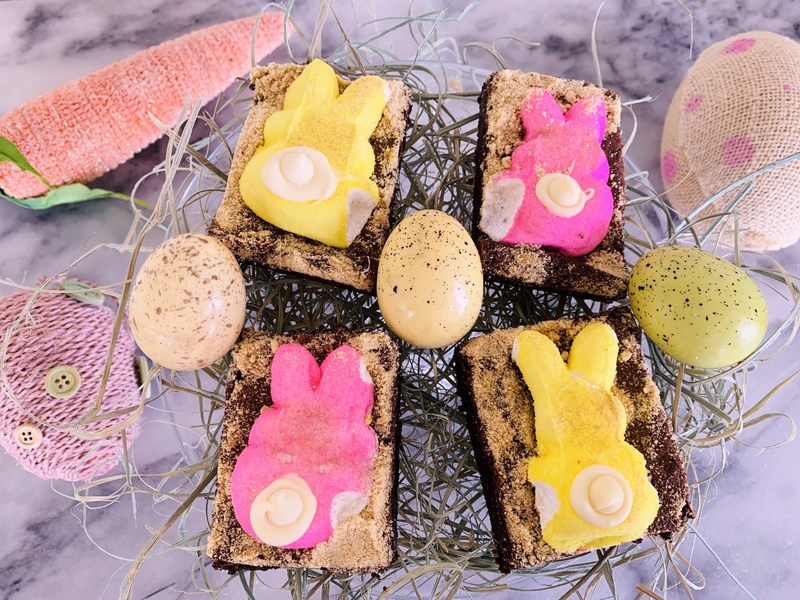 I then decided to sprinkle more graham cracker crumbs around the bunnies to look like loose dirt in a garden, and I think it worked – they reminded me of Mr. McGregor’s Garden (Peter Rabbit). These brownies are just as easy to make as a traditional recipe, but they are much cuter and definitely more festive. They do taste like a S’more and the rich chocolaty square does have one of the best ooey-gooey sensations out there. Preheat oven to 350 degrees. Grease and line with parchment a 13 x 9 inch pan. Make sure parchment hangs over edges of pan on two sides for easy lifting. In a large microwave safe bowl, add semisweet chocolate and butter. Microwave on high for 1 minute, remove and stir. Microwave again for 1 minute, stir until completely melted. In a separate bowl, stir together sugar, eggs and vanilla until creamy. Add cooled chocolate mixture and stir until combined. Add flour, 1 cup of graham cracker crumbs and salt, stir until combined. 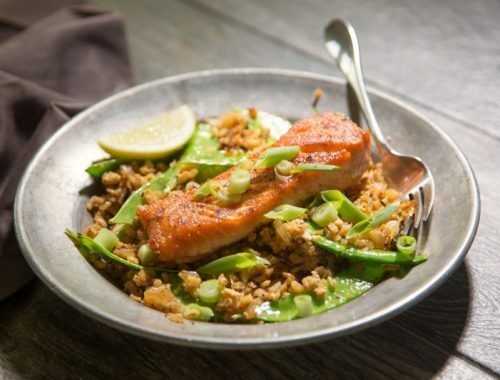 Spoon batter into prepared pan and bake for 25-28 minutes. 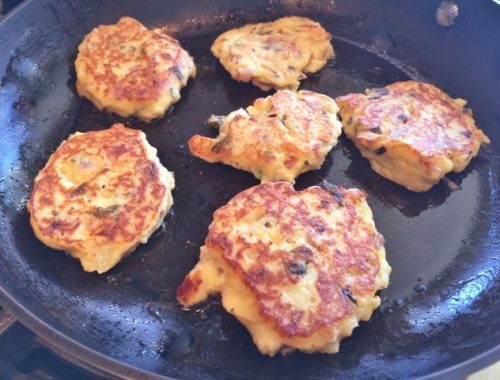 Remove from oven and place Peeps on top – space them into 12 portions. Sprinkle remaining graham cracker crumbs around Peeps. Bake in oven for 3-5 minutes or until Peeps are slightly puffed. Remove and let cool in pan for 1 hour. In a small bowl melt all, but 12 white chocolate chips for 30 seconds, stir. Heat again for 15 seconds and stir until smooth. Spoon small dot on bunnies bottom’s and place one white chocolate chip on top for tail. Place in refrigerator for 1 hour before slicing into squares. Enjoy! Baking with Gena BellBunny Brownies RecipeBurrowing Bunny Brownies - Recipe!Easter BrowniesEaster DessertsgenabellrecipesPeeps Brownies RecipeS'more Brownies - Recipe! 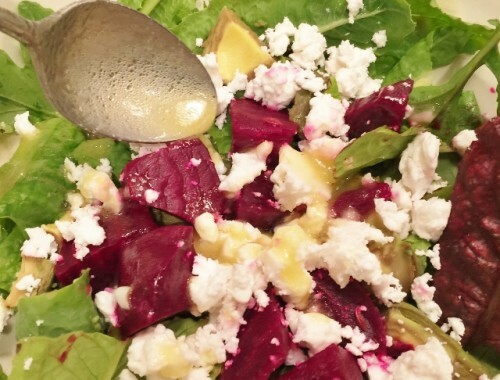 Pickled Beets, Avocado & Feta Salad – Recipe!